Off on holiday? Too many books to fit in your suitcase? Instead, why not download a selection of our eBooks to take with you? We have a range of over 1900 titles for you to choose from, covering fiction, non-fiction, and children’s titles, all of which can be downloaded and read on your computer, iPhone, iPad or e-reader. 6 books at a time can be borrowed for 3 weeks, and titles can be reserved if they are already on loan to another reader. The Zinio e-magazine service offers you a wide range of magazines which you can read online or download to read on your computer, tablet or e-reader. There should be something for everyone in the Zinio e-magazine service. You can choose from over 65 titles, covering current affairs, sport, film, hobbies, and much more. As well as the current issue, back copies are also available. There is no limit to the number of magazines you can borrow at any one time, and no limit to the length of time you can keep them for. There are times – while driving, for instance, or on a packed train – when a book just isn’t suitable. So why not let someone read it to you? The One-click Digital service gives library members access to over 1000 audiobooks which can be downloaded onto an iPod, iPhone, MP3 player or computer. Titles can be borrowed for three weeks, and you never have to wait – anything in the catalogue is immediately available for loan. Rhymetime for the under 5’s – We will also be a special Shakespeare Fairy Lullaby available to use courtesy of the CBeebies special version of a Midsummer’s Night Dream, that we will be using in our Rhymetimes at Wokingham Library on Wednesday March 16 at 11am and Finchampstead Library on Friday March 18 at 11am. Why not bring your child dressed as a fairy or one of the woodland creatures! Patchwork Classes- Come and make your own patchwork mug cosy, cushion or ipad cover. No experience required! Lower Earley Library Saturday March 5 and 12, 10am to 12noon charge £5 per session. Library Fest 2016 – Our Arts council funded festival celebrating all things arty will be back for 2016, launching on World Book Day on the 3rd of March and running till world book night on April 23rd. There will be events for children, adults and families, for those who are already art lovers to those yet to try their hand at something creative. From bookbinding, to life drawing, to Shakespeare there will be something for everyone. Feel inspired, try something new or learn a skill! Get Arty – Arts and crafts fun for families, Rabbit themed crafts and Shakespeare inspired colouring and crafts! For children aged 5 and over. £1.50 charge, just drop in! Code Club is a group for children aged 9 to 11 who would like to learn to program using the Code Club projects with the help of volunteers. 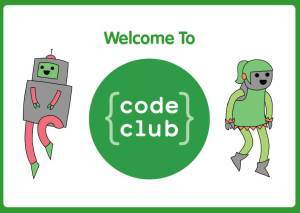 The Code Club projects are fun, creative and will help your children understand how to solve problems by breaking them down into smaller problems. The sessions will run on the First Saturday of each month – March 5, April 2, May 7, June 4, July 2, August 6 from 10.15am to 11.30am. 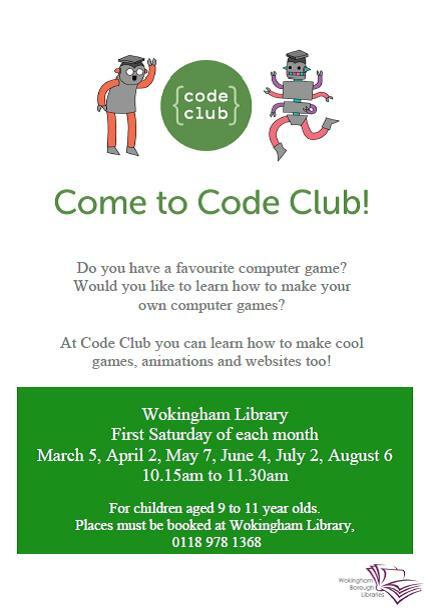 Places are limited to 10 spaces and must be booked at Wokingham Library, 0118 978 1368. Baby signing taster session with Tinytalk at Wokingham Library on Wednesday March 23, 10.30am to 11am. Call 0118 978 1368 to book a place. A group of children from Shinfield have created beautiful art work inspired by nature. The thirteen children worked with artist Jo Quinn, from Arts Charity Jelly to try out a variety of techniques, including dry point etching, mosaics, felt making, drawing and mask making. They also learnt about artists and got creative with natural materials. The work they created has led the group to receive their Arts Award at Discover level . Arts Award is a qualification run by the Arts Council and to achieve Discover, children and young people discover the arts around them, find out about artists and their work and share their experiences with others, gaining a certificate at the end. 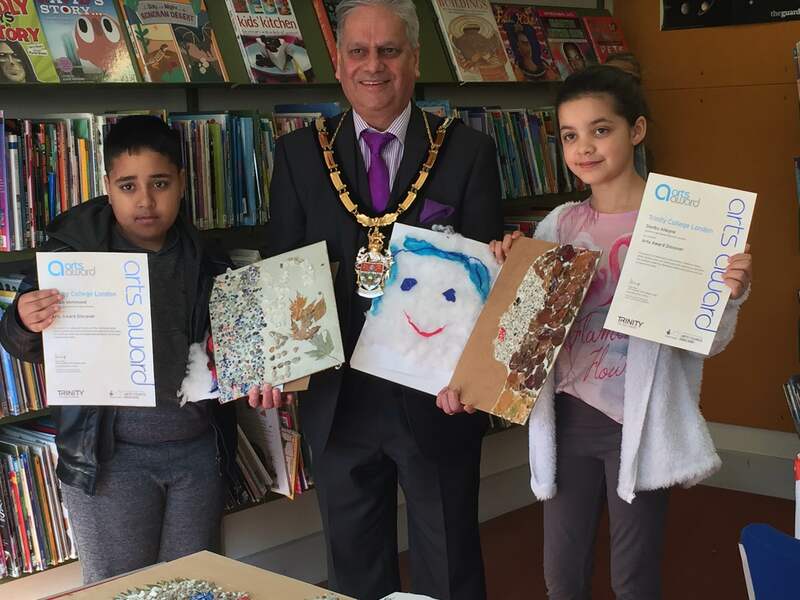 T o celebrate this achievement The Mayor of Wokingham Cllr Parry Batth presented the children with their awards at Lower Earley Library in a ceremony for their friends and family. Wokingham Borough’s libraries are a great success story – bucking the national trend by actually increasing usage – and now you can help write their next chapter by giving us views on how can continue to enhance and expand what we offer. While library usage is down across the country, Wokingham Borough’s libraries are on the bestseller list – with library usage increasing by nearly 6,000 from 2013/14 to 2014/15 and on the up again this year – and Wokingham Borough Council is determined to enhance them even further. In order to achieve this, the council’s decision-making executive on January 28 approved a public consultation on the draft library offer – which includes proposals to open the borough’s main libraries for longer by introducing some self-service facilities. The consultation will end on March 25 and all comments will be considered before the council decides later in the year on whether to put the library offer into action. The offer envisages a system of ‘hub’ or main libraries (at Woodley, Lower Earley and Wokingham) and smaller ‘spoke’ libraries elsewhere. Libraries offering self-service would be staffed for some core hours, but offer extended opening hours with self-service. This is the council’s ‘preferred option’ for providing library services; however the consultation will seek views on this and on alternative possibilities. Visit the consultation webpage to give your comments on the draft library offer from Monday 1 February 1 to Friday 25 March. 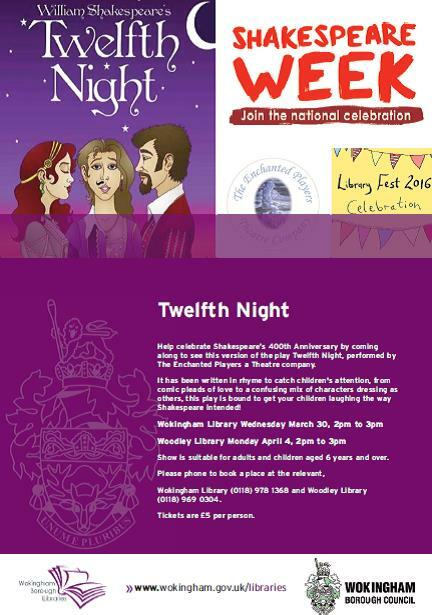 Shakespeare Theatre Show – Twelfth Night – Shakespeare show for all the family. This version of the play has been written in rhyme to catch children’s attention, from comic pleads of love to a confusing mix of characters dressing as others, this play is bound to get your children laughing the way Shakespeare intended! £5 charge. Places must be booked. Shakespeare Play Reading Morning – Come and enjoy reading aloud from one of Shakespeare’s best loved comedies, Twelfth Night. Wokingham Library Friday April 29 at 10am to 12noon. There will also be a special Shakespeare Fairy Lullaby available to use courtesy of the CBeebies special version of a Midsummer’s Night Dream, that we will be using in our Rhymetimes at Wokingham Library on Wednesday March 16 at 11am and Finchampstead Library on Friday March 18 at 11am. Why not bring your child dressed as a fairy or one of the woodland creatures! 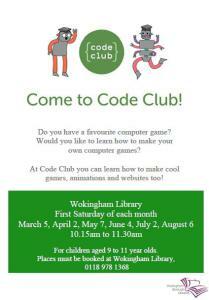 Code Club is a group for children aged 9 to 11 who would like to learn to program using the Code Club projects with the help of a volunteers. 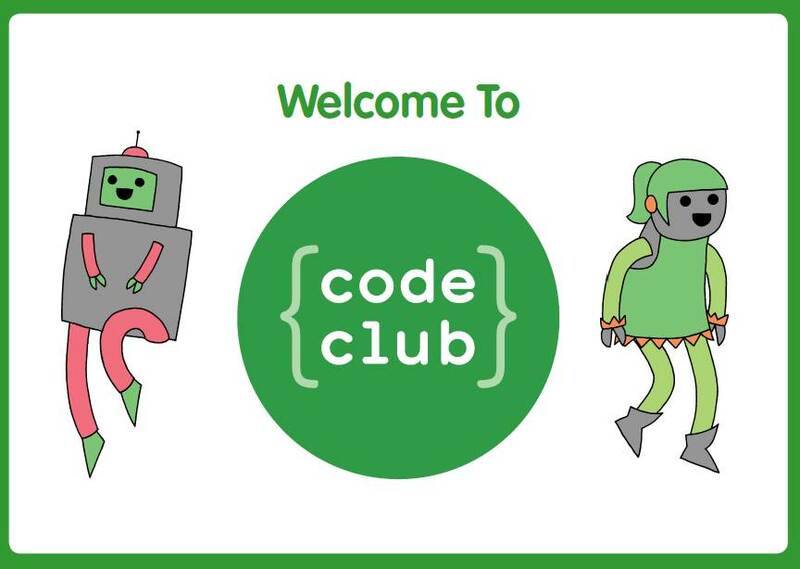 The Code Club projects are fun, creative and will help your children understand how to solve problems by breaking them down into smaller problems. Our first set of projects uses Scratch which is software you download from the internet. We encourage children to carry on with their projects at home if they have enjoyed them. The sessions will run on the First Saturday of each month – March 5, April 2, May 7, June 4, July 2, August 6 from 10.15am to 11.30am. As part of the consultation, we will also be engaging directly with a range of groups representing residents with specific needs such as vulnerable adults, children and young people and older residents, in order to ensure their views and experiences are fully understood. Nominations have been published for two of the most prestigious prizes in writing and illustrating for children. 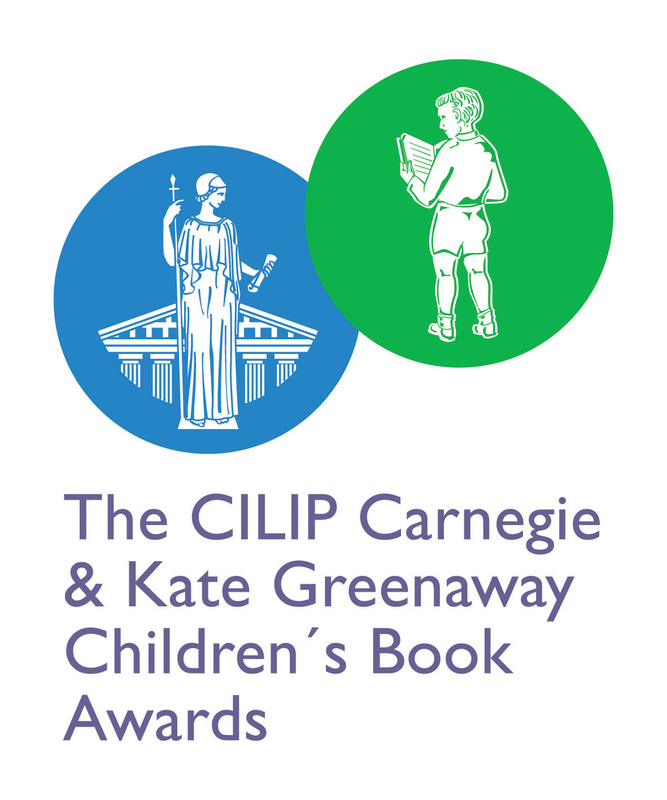 The CILIP Carnegie Medal is awarded annually for an outstanding book for children and young people while the CILIP Kate Greenaway Medal is awarded for an outstanding book in terms of illustration for children and young people. 93 books have been nominated for the CILIP Carnegie Medal and 69 nominated for the Kate Greenaway medal. The official long and shortlists identify a range of outstanding books for children and young people of all ages and interests and from new and established authors and illustrators. Our Reader Development Officer for Children, Elizabeth McDonald is currently judging this year’s prize, along with 12 other judges from around the United Kingdom. Barry Stebbings from the Wokingham Library Poetry group has written this poem to remind us that Spring is on the way. ’twas cold and wet and chill. And cramp in all my roots. With cold and muddy boots. And flower to welcome Spring.